Thanks for your interest in working at a NASA Mid-Atlantic event! No matter what your experience or interest, we can use your help, and we always love to see a new face. Please contact Laura Cobetto at 804-883-7887 or laura@nasaracing.net if you have questions about the worker information below. Grid – You may have a variety of responsibilities such as checking driver wristbands, tech stickers, placing cars in proper order, etc. May be issued radio and headset. There will be worker breaks and you must have permission of the chief if you need to vacate your spot at any other time. You will be issued a tan officials shirt which you must return at the end of the weekend. Timing and Scoring – You will be present in timing and scoring for all race practices, race qualifying sessions, races for all race groups (and between race sessions if manual taping review is required). You will write down car numbers as they cross the finish line. This documentation provided by 3 people is the back-up system in case we had a computer failure for our timing system. Due to the fact that there is more free time built into the schedule for timing and scoring helpers, we generally ask those people to also help with an additional responsibility such as tech, registration, party set-up, touring laps, etc. Flagger – Must be trained. Communicates safety information to drivers from an assigned corner station. Is issued radio and headset. You do not have to have prior training to be a worker, but you must be 18. Your first weekend working for NASA is considered a training weekend in which you receive no credits or pay. You will receive free lunch on both days, dinner on Friday night if you are present, and a party on Saturday night. If your chief is satisfied with your performance after your first training weekend, you will receive pay for future weekends. 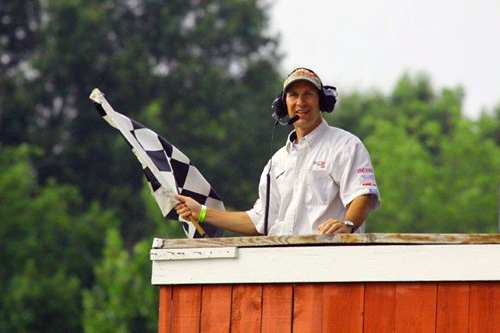 Grid and timing positions receive $150 per weekend; flaggers receive $165 per weekend. To register to work an event, you may register online at the driver registration link provided on nasaracing.net, or you may e-mail laura@nasaracing.net. Please include all your contact information with your e-mail. Registrations are accepted on a first come, first serve basis, and we do have a limited number of regular worker positions. We do our best to honor the position you have chosen, but it is possible we may need to change your job depending on our needs for the weekend. If you are uncomfortable with a particular job, please let Laura know. You will be e-mailed on Sunday prior to the event and given your schedule and responsibilities. If you cancel less than 5 days prior to an event, you may be put on probation and not allowed to work for a certain number of events. If you are a no-show and do not attempt to contact us in any way, we have the option to shave your head, tar and feather you, and shame you in any form we desire. Workers receive 2 lunch tickets, and dinner and drinks are available on Friday and Saturday evening. We also keep the coolers filled at the Cobetto Trailer with water, and this is for all workers. Please bring a cooler for any additional snacks or drinks you may need. At the conclusion of the event, you will receive your payment from your chief. We do appreciate your hard work at our events, and we wouldn’t be where we are today without the help of all our enthusiastic Officials! Thanks for coming out to play with us!